"What is that? ", I hear you say! the first of this year's "Four-In-Art" mini. theme for February was "Microscopic". Year 7 Science class last year! But overall, I am pleased with the final result. Beads, sequins, felt, fabric and thread. Science Labs where I teach! And one last shot of it on my wall of minis. It's beautiful! I think you really captured the quality of those lovely algae, but it's lovely even if you don't know what they represent. Such a fun little quilt. 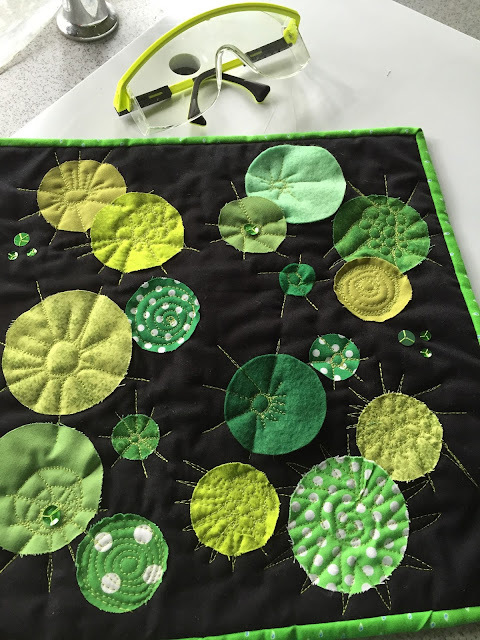 I really like the algae, which are actually quilt lovely, and your interpretation is great. Artistic license is what makes it fun! And these are such lively interpretations of the theme. I like fact you used various stitching patterns to secure them. 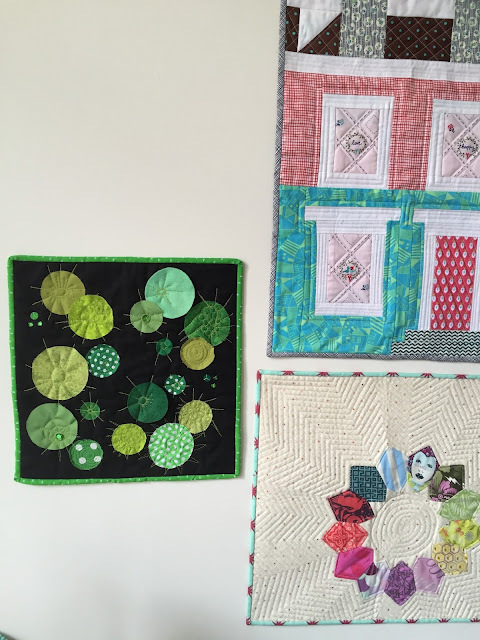 Just love your quilt and post - looking at your stack of greens gave nothing away! I think my favorite part is how you chose a minimalist approach to stitching down the cells (I'm too often tempted to overdo). How fun! I will never look at algae the same way again! Love your interpretation. Went and had a peek at the others in your group. They were all really different and fun. So many good ideas! It looks great. As a science teacher you must have had so many possibilities running through your head. I do like what you decided to do. How great to be part of a group like this. I LOVE this little quilt--looks like you and I went for the circlular molecules/things, and how well yours turned out! I was smiling broadly as I read a long, then broke out in laughter at the photo of the quilt with Mr. Kirchner looking it over--so clever! 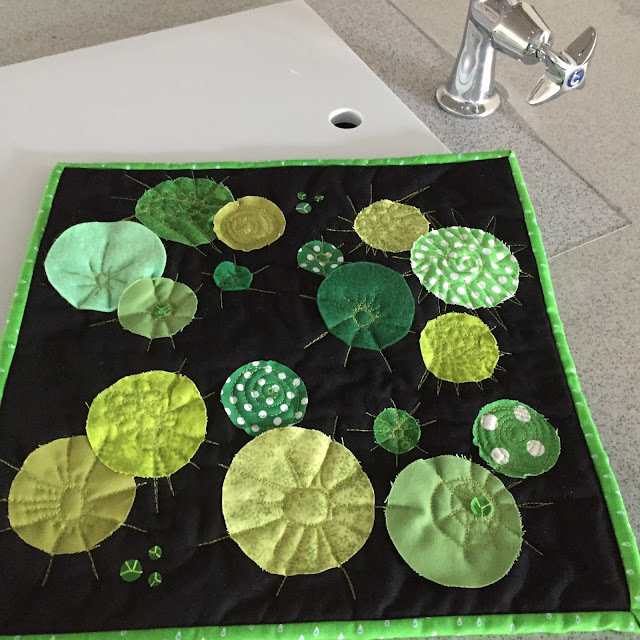 I think you did a great job of getting those circles on there with interesting types of quilting and attaching--the stitching a great counterpart to the green volvox (and now I think you should make the outfit in the first part--just to impress your students). Such a terrific quilt, Susan! Love it! So cool to take an idea from inspiration to finished project. Bravo, Susan! Love those greens! And I can see how the algae inspired you. 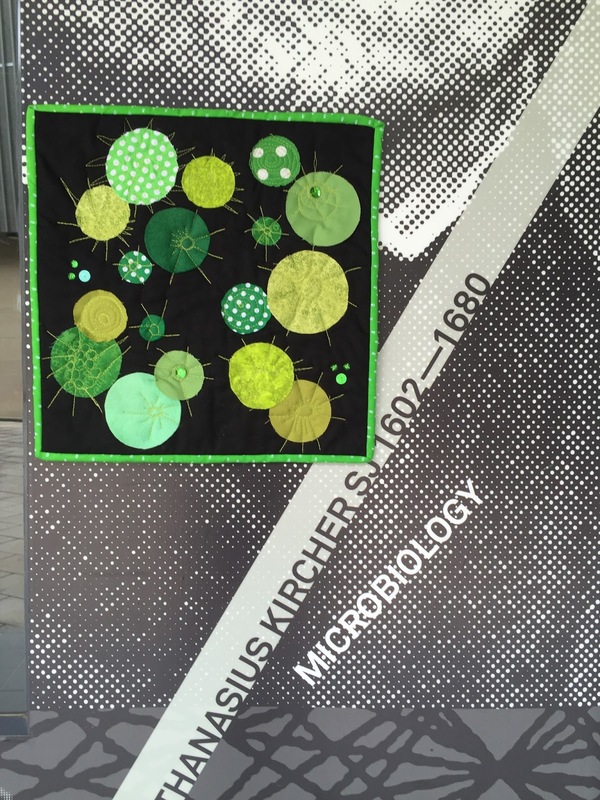 Your Volvox almost look alive in that quilt! This little quilt is very clever and quite adorable. I love the different backdrops on your photo shoot too! I love the story behind this quilt. Great interpretation. Inspiration can be anywhere. Love the end result. Well that's interesting! Love the greens in it, and the raw-edged appliqué. And your photographs of it are lovely. It's great to see how each of you challenges each other. Looking forward to seeing whatever comes up in May! Wow! I think you nailed that one! I love the texture the stitching gives. And photographing your mini in the lab is fun! 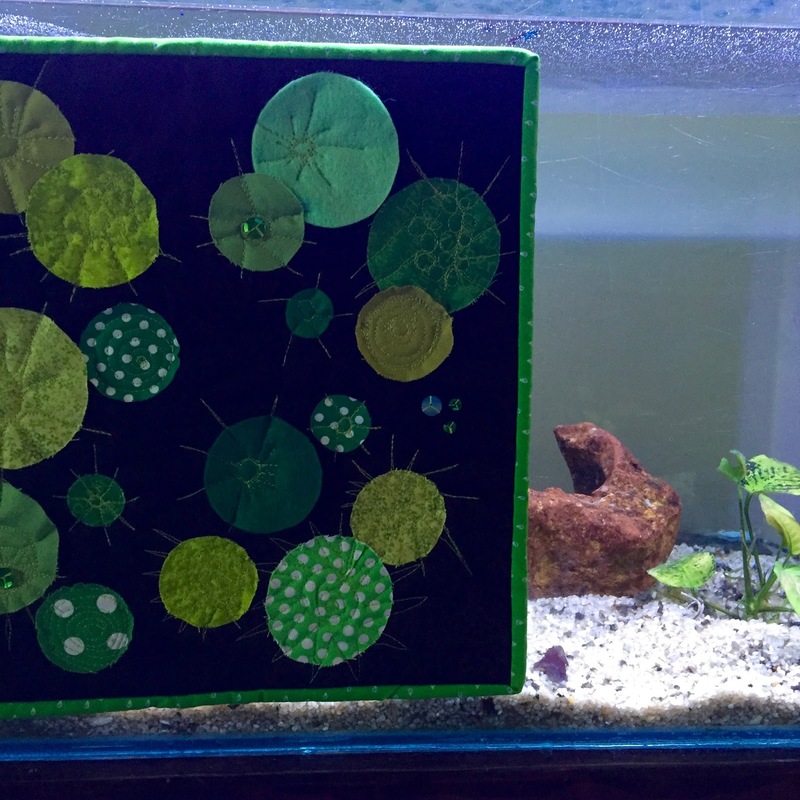 Love your algae art quilt! Great interpretation! Firstly I love that you teach science! 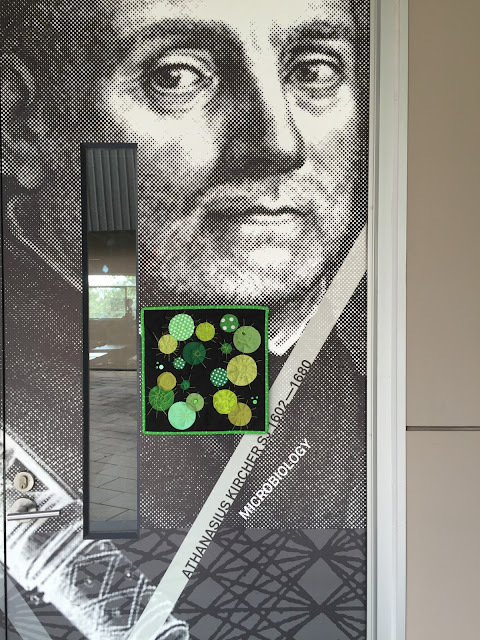 I love your choice of how to photograph your mini quilt - amongst the walls of science itself. 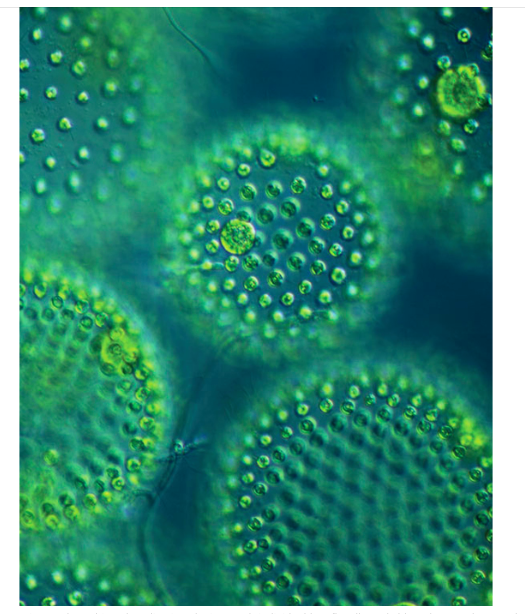 It's amazing how one can be inspired by green algae, but on a microscopic level it has such beautiful shape and color. I hope your students get to see this one. Never heard of Volvex but I can see why you chose it. The images you found are really cool. 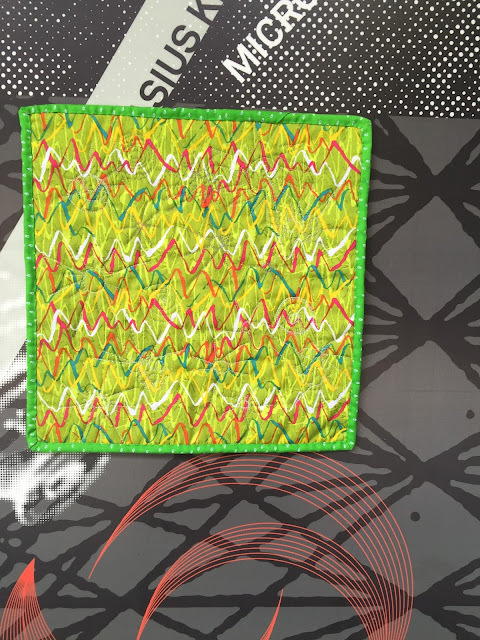 Love how the stitching you added really seems to animate the entire quilt as if it's growing. And of course it's green, my favorite color. The algae is a great inspiration. Now I have learned something new too. 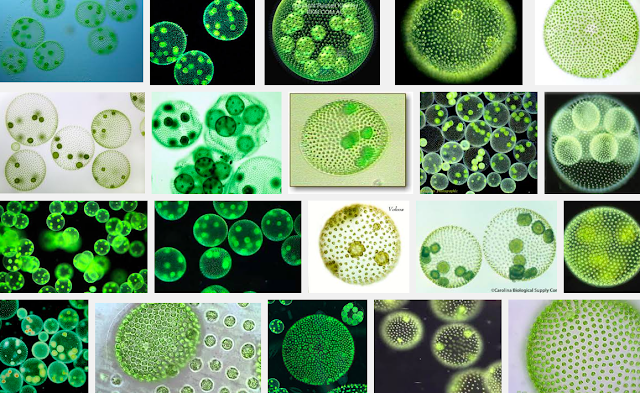 I thought volvox sounded a bit like Ultravox, the 80s band! What will you choose as your theme? Volvex is a new word for me but I can see why you chose it for your project. Great interpretation of the theme. I love how you photographed your quilt in the science lab. Perfect! Have you chosen the next theme yet? I think Volvex is the most interesting inspiration I've ever heard of for a quilt but it works so well. Your quilt is so clever and fun to look at. I wonder what theme you'll come up with?